This is my review of the Swissport lounge in Heathrow Terminal 3. I decided to visit them all! Yesterday I reviewed the No 1 Lounge lounge. After my visit I walked next door to the Swissport lounge. You can access this with a Priority Pass (via Amex Platinum, or you can buy one) or Lounge Club card (via Amex Gold). You also pre-book access to the Swissport lounge for cash via their website. This could actually have been a very short review – don’t go there! Given the discerning nature of Head for Points readers, I will provide some additional photographic evidence of why you shouldn’t go there. Remember that next door is No 1 Traveller with its cinema, games room, library, buffet, full bar and cooked to order bistro options …. I didn’t get a picture of the bar. To be fair, there is no shortage of alcohol – which is good, because you would want to pour yourself a stiff one if you’d paid to come here. The alcohol is also self-pour, whilst No 1 Traveller insist on pouring for you. I should also say that Aspire / Swissport / Servisair lounges usually come with a good range of reading material and this was no exception. It was the only place I found an Economist, for example. The rest of it is just dismal and depressing, frankly, and you would be better off in the main terminal. If you have a Priority Pass card, head for No 1 Traveller. End of discussion. No 1 Traveller is not in Lounge Club. If you have a Lounge Club card via Amex Gold with two free lounge visits loaded, please do not use them here unless they are about to expire. There are far nicer lounges out there. Next time, I begin my tour of the three oneworld lounges in Heathrow Terminal 3 ….. I came here once. Was flying Virgin Premium Economy and had Lounge Club card from my Amex a Gold. I agree – totally dismal and depressing and we left quite quickly and went to Strada for lunch. I am a big fan of your reviews, Raffles, but on this occasion your verdict seems a bit harsh. 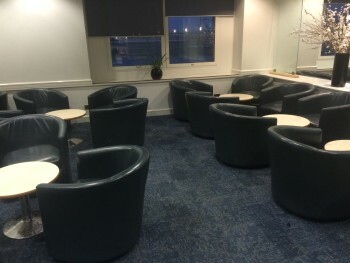 At least from your photos (I have never been there myself) this lounge looks perfectly acceptable to me if you are looking for a quiet seating area where you can pass some time reading or working on your laptop. 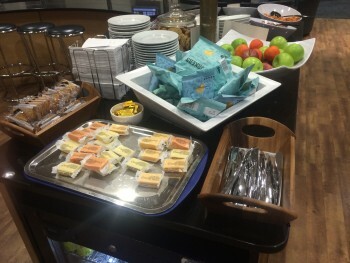 I travel in BAs Club Europe regularly, and half the passengers don’t take any food at all – those would probably be absolutely happy with the frugal selection in this lounge. At least the place looks clean (unlike the disgustingly dirty BA Galleries Lounge in MUC I visited a few weeks ago). Obviously, we have all got different preferences. I think the harshness is due to No 1 Traveller being so much better. Kinda like flying F for your first time and it’s on BA, whereby you consider it the greatest thing ever, yet then when trying a decent airliner you realise you’re mistaken. It really is as bad as I say. The photos do not give the full impression, for eg the 30 year old polstyrene ceiling tiles and those terrible mirrored ceiling lights that were de rigeur in cheap office blocks in the 1980’s! This looks quite appealing though if travelling with very young kids and you want some empty space where they can eat/fidget without distrubing others! Is it just the T3 Nbr 1 Lounge that isn’t on Lounge Pass? 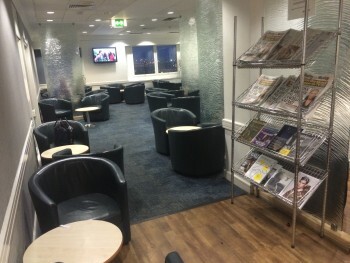 I recently used my free lounges at the Nbr 1 in Gatwick North. Totally agree with your review. Went there last month with my wife using our Amex ‘free’ Lounge Passes. My exact comment was – if had not been free, I would have wanted paying to go in there. To be really blunt, if someone had had a project to create the worlds worst ever lounge they would have won by miles!! A characterless white box, crammed full of seats with very few people in. Our next lounge later that day was – Waldorf Astoria Dubai Palm, in one day we saw the two extremes! This was the standard of 3rd party lounges until the likes of No 1 and Premium Plaza arrived! Indeed, looks very similar to T1 Servisair lounge! Food similar to the old EDI one too, thank goodness it’s Aspire now! … and sadly, Andy, still is the standard of many third party lounges at several airlines outstations around the world. Including in Europe. So what are the best lounges to go on a Lounge Club card? If you are passing through Dubai, then the paid for lounges are all good – DCA lounge (very good food selection) and the Marhaba lounges. A bit of peace and quiet in a huge, noisy airport. Oh dear, we fly from Terminal 3 on Saturday morning and return from Councourse F in Miami next month. I was hoping to use our free Lounge Club passes but both available lounges seem to be missable. The Club America one in Miami has been described as the worst lounge in the world! Beginning to wonder if Lounge Club is a perk worth having? I guess you saw the No1 review yesterday? You can buy lounge passes for £12.50 net on the Avios site. Yes thanks Harry, we’ve done that before and found the lounge really worth while. I was just hoping to use our free Amex lounge passes. Not so bad on the alcohol front, not over-crowded, bit of cheese & crackers always welcome, good reading material selection, away from the madding crowds. Want to pay cash? Take your money into the terminal (or No 1) where you get a far better deal. Is it harsh? Certainly as a leisure traveller I expect something a little ‘premium’ from a lounge. This hardly seems premium! Would premium alcohol count? If it’s self-pour, then JWBL whisky would be a major plus, for example. Raffles normally notes details astutely – could you fill us in on the booze? Champagne is the only thing I check and it doesn’t have any. I still think there’s a case for doing a note on the Barclays Dragonpass lounge card. Only relevant to 20% of the readership at best and goes against the spirit of the offer. For info, I was told today – possible incorrectly, but the person who told me was told by a lounge employee – that all Airport Angel cards will stop working on 31st December irrespective of the date on them. I had this emailed to me today from airport angels regarding their Barclays’ branded cards .. I know many of us have there via a “wheeze” but it seems as if its come to an end.. 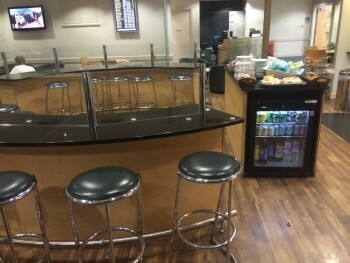 There is another thread about this somewhere and I will update that too if I can find it..
Barclays have found a new lounge supplier which will be taking over from Airport Angel. For your new membership card, you will need to contact Dragon Pass on 0333 220 5599. All AA Barclays memberships will expire on the 29th November – cards will not be valid passed this point. Barclays are in the process of communicating with all of their customers regarding the provider switch. I hope this answers your query but please do not hesitate to contact us again if needs be. Totally agree. I went there last month using lounge club. Did a bit of work when I eventually found a socket that worked. Left for my flight feeling slightly robbed.